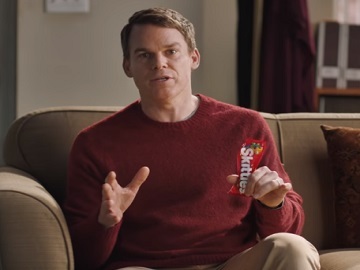 Skittles has revealed that Michael C. Hall stars in the brand’s commercial “The Broadway Musical,” 2019’s biggest ad that won’t appear on the Big Game. The Dexter actor is featured on a 90-second spot as himself in a therapist’s practice, trying to deal with his anxiety about starring in Skittles commercial The Broadway Musical. “I have been having some doubts. I mean, I don’t really do ads,” he says. The specialist points out that it would be stressful to be seen by millions of people in the Big Game, which leads to Hall clarifying that the ad won’t be on the actual game and that people will buy tickets instead and watch it live in a theater. Surprised to learn that, the therapist is told that “it’s a real Broadway show”. At this point, a scarecrow shows up, willing to “provide some clarity”. After introducing itself as “the living manifestation” of Michael’s anxieties, the scarecrow – who it turns out believed Michael would star in an TV ad on the game – finds out that “it’s a live Skittles musical ad performed in a Broadway theater”. At the end of the therapy session, while chewing some Skittles, Hall – who is told by the therapist that they think he makes terrible career choices – answers he won’t make this Skittles ad and that he’ll never make an ad again. Soon after he ends the sentence, the lights are turned off and a round of applause is heard from the audience. It turns out he’s been in a Broadway theater all this time. Skittles Commercial: The Broadway Musical will be performed at The Town Hall on February 3rd, 2019. Written by Brooklyn-based playwright Will Eno, whose play “Thom Pain (based on nothing)” was a 2005 finalist for the Pulitzer Prize in Drama, the musical features original songs backed by a live band. Proceeds from ticket sales benefit Broadway Cares/Equity Fights AIDS, a nonprofit organization that helps ensure that men, women and children across the country and across the street receive lifesaving medications, health care, nutritious meals, counseling and emergency financial assistance. Skittles has informed that Mars Wrigley Confectionery US, LLC will donate an amount equal to the sales proceeds with a minimum donation of $25,000 and a maximum of $50,000.